The 21st Century Workplace -- Are Women the New Men? The workplace is constantly in flux, and even now there are new opportunities open to women. But to take advantage of these possibilities, it's essential to know the current rules for corporate success. This isn't your father's or your mother's workplace anymore! Whether it's the CEO seat, an executive manager slot, or a more intrapreneurial position, women who follow Career GPS will have what it takes to gain their professional goals. Think working hard is enough to be recognized? It's not enough to assume your effort will speak for itself. You have to socialize with the decision makers. It might not mean you have to pick up the golf clubs, but you do have to figure out what works in your own organization. Parlez-vous Françis? Learning Mandarin? If you work for a global company and aspire to an extreme job or higher, make it known that you would take an overseas assignment to advance your career. Nowhere to go right now? Even in hard times there are options. Learn a lateral skill -- such as accounting -- so when the company is firing on all engines again, you will impress through the breadth of your knowledge. 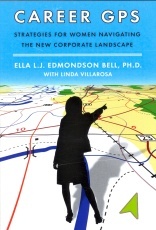 Drawing from her work as a consultant to some of the country's most prestigious Fortune 100 companies, Dr. Bell helps readers succeed at every level in a dynamic corporate marketplace. Career GPS combines Dr. Bell's academic knowledge and expertise with dozens of heartfelt first-person stories from smart women who rose through the ranks. Here is a book that will guide women of all cultures, ages, and levels of experience to their career goals.